From 1st – 5th October, Bristol tech businesses hit Oracle OpenWorld in San Francisco. SETsquared Bristol members YellowDog and Zenotech plus the new UK Oracle Startup Cloud Accelerator startups attended. 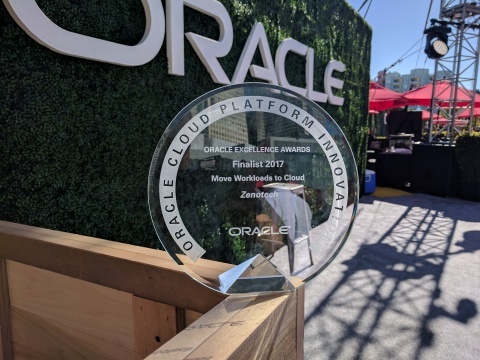 Zenotech was a finalist in the Oracle Excellence Awards, presented by last year’s winners YellowDog and Oracle accelerator representatives. The annual Oracle OpenWorld conference in San Francisco took place in the first week of October, and this year there was a remarkable Bristol stronghold in attendance. SETsquared Bristol alumni, cloud-based solution company Zenotech, was a finalist at the Oracle Innovation Award in the “move workloads to the cloud” category, in recognition of its innovative use of Oracle’s Cloud Infrastructure, presented by YellowDog and Oracle Startup Cloud Accelerator representatives. Throughout the week the Bristol-based tech cohort shared expertise and showcased innovations to a global audience at one of the largest tech conferences in the world, on the power of the cloud. Mike Turner, Zenotech’s EPIC software product lead, shared his insight to Oracle Cloud Infrastructure through a series of sessions on Optimising Wind Farms with Oracle Cloud Infrastructure, and building Best-in-Class Performance Apps in the Oracle Cloud. YellowDog’s founder Gareth Williams, who won last year’s Oracle Innovation Award, joined Intel’s keynote on the emerging power of the cloud, to share his leading expertise as the world’s only provider of #LimitlessCompute. The recently announced SETsquared Bristol and Oracle Startup Cloud Accelerator program members were also showcasing their cutting edge technology – molecular simulator Nano Simbox inventors Interactive Scientific, machine learning and machine vision marketing technologists Duel, complex database developers for AI GRAKN.AI and searchable maps based on travel time innovators iGeolise – marking their entry to the global business tech stage and the beginning of their own journeys to success, representative of Bristol as a breeding ground for tech innovation.